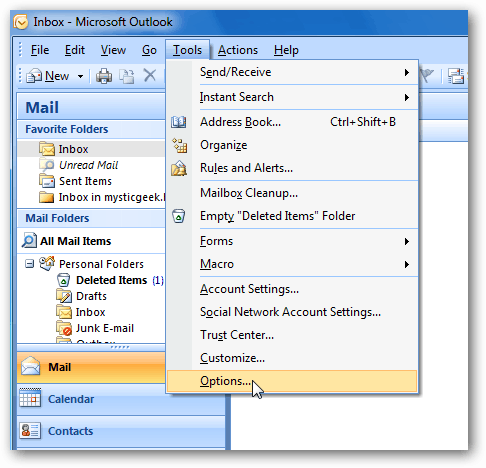 The search option in Outlook does a decent job searching a single folder. But this limits you if you’re looking for that hard to find email. Here’s how to add more folders to your search. It’s frustrating when you can’t find an email someone sent you several moths ago. 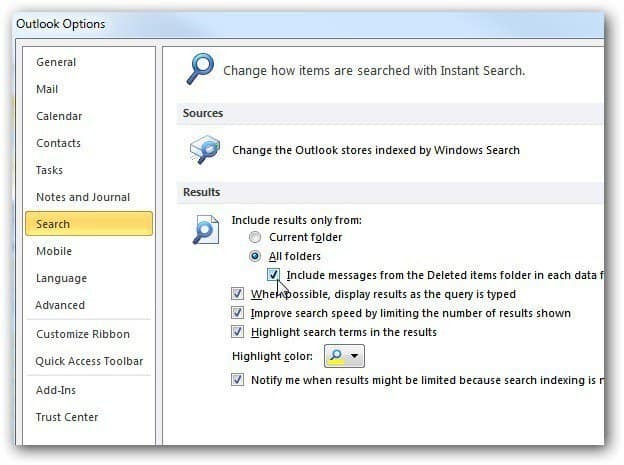 By default, Outlook will only search the Current Folder you’re in. 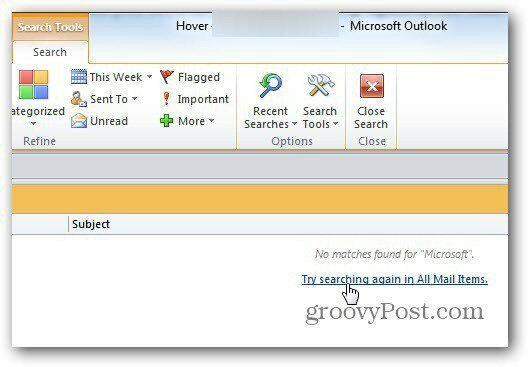 Here you can see in the Search box Outlook is only searching my Inbox. 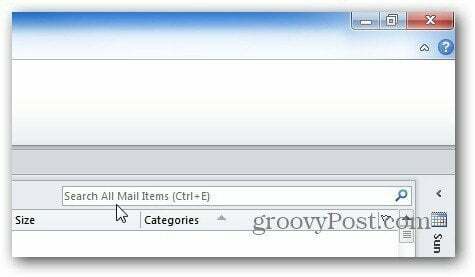 After doing a search, if there are no results or not the one you want, click Try Searching Again in All Mail Items. This helps to find the email you’re looking for. There’s no reason to have to search all of your folders twice though. 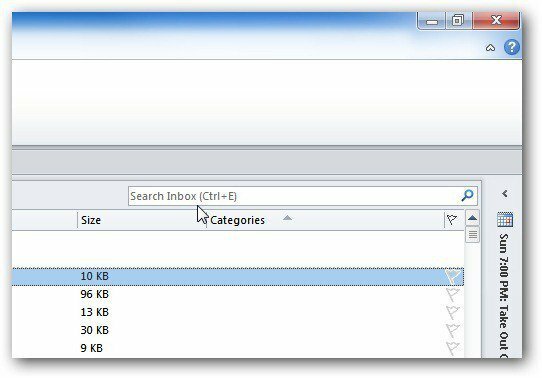 Here’s how to always search All folders – including Deleted Items in Outlook 2010. Click the File then Options. Outlook Options opens. 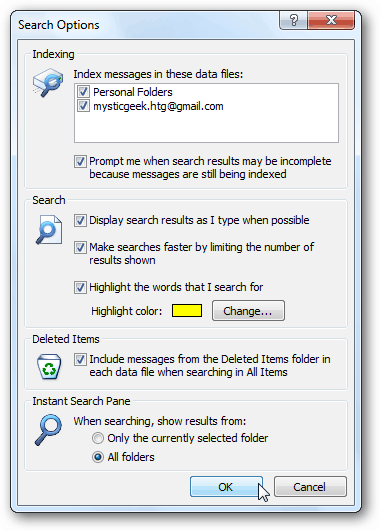 Click Search, then under Results, select All Folders and Include Messages from Deleted Items. Another handy tool I like is having the search terms highlighted so they’re easier to find. 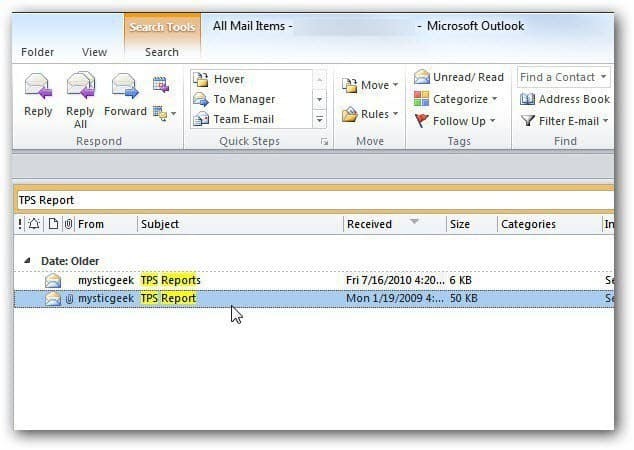 Click OK.
Now, Outlook will always search All Folders and Deleted Messages too. Very handy. By searching All folders including Deleted Items, you’ll have a better chance at finding those TPS reports that the boss is asking for! 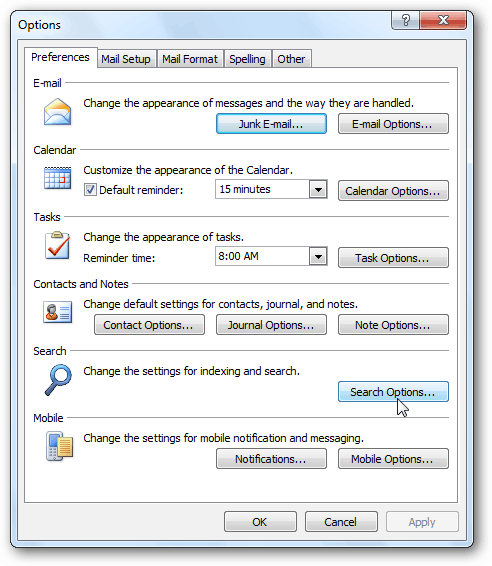 You can set up the same settings in Outlook 2007 too. Click Tools >> Options. The Options window comes up. Click Search Options in the Search section. Now, select Deleted Items and All Folders in the Instant Search Pane. 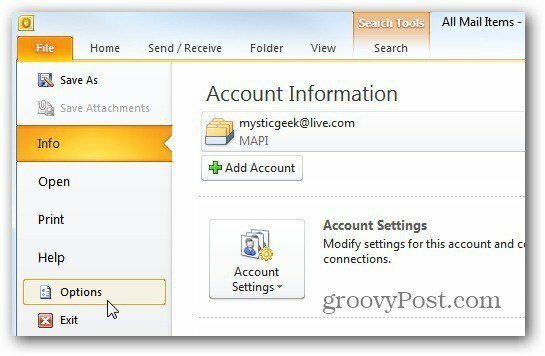 If you’re looking for a hard to find email, using these options will definitely help you out. It seems clunky to ALWAYS search all folders. We teach people to create a new view (Right-Click on Search Folders) and skip the criteria section. Outlooks warns you that All emails we be included in this View – which is exactly what we want. We then modify the view to include the Column called – In Folder – so a person knows at a glance if they are filed as expected. 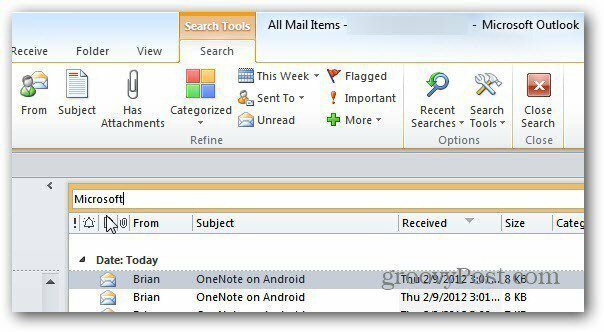 How do you find out where the file is once you search ALL MAIL ITEMS? We have group mailboxes, and sometimes a file ends up in someone elses’ mailbox and we need to retrieve it. How do we view properties of the mail item to see its current location?